Richard Bean rewrote this play specifically for this venue, relocating the drug-retailing family to Petersham and including lots of local references which some of the audience found particularly amusing; presumably we weren’t the only non-residents attending the performance who didn’t understand all these jokes, although we got the gist most of the time. Aside from the local stuff, there were a lot of very funny lines, though not enough to make this more than a patchy comedy at best, but as the funny stuff was well worth the trip we’re not complaining. As Steve remarked, you wait years for a Pinero and then three come along at once! (The Magistrate at the National and Trelawney of the Wells at the Donmar are the other two – we’ve booked.) We saw this play thirty years ago at the National, with Felicity Kendal and Leigh Lawson playing the Tanquerays alongside a classy support cast. The story had faded; all I could remember at this distance was that Felicity Kendal was a troubled woman with a past, that I felt sympathetic towards her, and that we enjoyed the play. Not a lot to go on, but enough to make us keen to see this revival at long last. The set had another picture frame straddling the stage, a slim one which didn’t intrude too much into the acting space. The opening scene was set in Aubrey Tanqueray’s rooms at the Albany, at the end of a meal with two of his friends; the dining table with appropriate debris was on the left of the stage with a cabinet behind it, a wide doorway screened with a curtain was centre back and a chair, sofa and fireplace were on the right hand side. For the rest of the play, the location was Highercoombe, Mr Tanqueray’s country house. The second act was in the breakfast room while the final acts took place in the drawing room. The breakfast room had the table on the right of the stage with a different sofa and chair on the left and no curtain over the doorway. The change took a little time, and Mrs Tanqueray had already turned up before it was complete. She waited, looking somewhat bored, while the servants completed their task, then sat down to wait for the start of the scene. During the interval the furniture was completely changed, with a circular seat over on the left, a sofa on the right with a piano behind it and various tables and cabinets. Everything was in period style, as were the costumes, and despite the sparseness of the design it worked well for this production. Not as sumptuous as the National, of course, but better for this space. The plot was relatively simple, but there was some back story we had to be told during the first act. Mr Tanqueray was a widower with a daughter in a convent whi was shortly due to become a nun. The following day he was to marry again, and his wife had a past, which was why he hadn’t mentioned the impending nuptials earlier to his friends. There was a good deal of discussion as to the social consequences of marrying such a woman, both in terms of Tanqueray himself and in relation to Sir George Orreyed, who had himslef only just married another scarlet woman, much to his mother’s distress. We learned a lot of this from the conversations between Tanqueray’s friends; Tanqueray obligingly took himself off to write some letters – the 19th century equivalent of sending a few texts. To avoid being disturbed, he went into the next room, so his friends could gossip freely, and what fun it was! Cayley Drummle, Tanqueray’s closest friend, stayed after the others had left to get more information about the bride-to-be, and this was followed by a visit from the lady herself, so by the end of the first act we were pretty well acquainted with the situation. The future Mrs Tanqueray had made her living by associating with a series of men, not actually married to them but adopting their names and being a charming hostess to all their friends. Aubrey was convinced that she’d been treated badly by each and every one of these men (the brutes!) but I wasn’t persuaded so easily. With Tanqueray’s young daughter Ellean (pronounced Ellie-Ann) returning home after receiving ghostly guidance from her deceased mother, there was very little likelihood of this second marriage ending happily, and so it proved. We’d both forgotten the dramatic conclusion to the play, but it was not unexpected given the circumstances. Laura Michelle Kelly showed us Paula’s nervousness and waywardness along with some of her charm and intelligence, but I wasn’t always clear why Aubrey found her attractive. Her dignity started to show through in the later scenes, and there was a sense that but for misfortune she might have been both a decent human being and acceptable to Victorian society. James Wilby did reasonably well as Aubrey Tanqueray, but despite his ability as an actor he seemed to be rushing his lines so much that I missed many of them – very puzzling. Rona Morison was suitably priggish as Ellean, with a noticeable change when she arrived back from Paris, and Joseph Alessi gave perhaps the best performance as Cayley Drummle, Tanqueray’s confidante, gossip-monger and the life of the party. There were good supporting performances from the rest of the cast as well, and the production was nicely balanced. It was good to see this again, and I hope we don’t have to wait so long for our third opportunity. We saw this play many years ago at the Royal Court (1988) where they played it paired with The Recruiting Officer, the play being rehearsed by the convicts. The casts were the same, so we had all the fun of seeing the actors rehearse as convicts and then play the same parts for real. 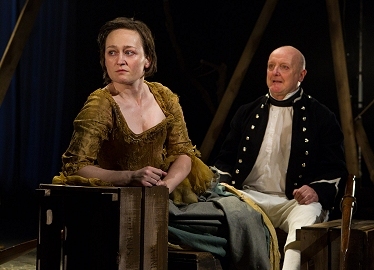 As it happens, we’re going to see The Recruiting Officer in a few weeks, as Josie Rourke has chosen that play to start her Donmar reign; although the actors won’t be the same, it will be interesting to see the combination again. The set was evocative; there were two wooden frames which dominated the stage, and one of them had some pulley tackle attached which could have been on a ship or part of a construction site, both appropriate for the play. There were wooden boxes scattered around the place as well, and these performed a number of roles – mainly furniture, but they even stretched to a rowing boat at one point. A table was brought on from time to time as needed and there were blankets for the stage curtains; that was about it. The convicts were in tatty clothes of the period, while the officers wore splendid red coats and wigs. There was also a Reverend dressed in sombre black. As almost everyone doubled up at least once, the women all played officers as well – one played the parson – and they all did a very good job. The opening scene is set on the ship taking the convicts out to Australia. As one chap was being flogged by a couple of the officers on the central frame, the other convicts huddled on the front of the stage, singing a song. The image of brutality was very clear. The next scene introduced us to the Captain and some of the officers. Their conversation covered the nature of the penal colony they were now running, their differing attitudes on punishment vs. rehabilitation, and the unusual flora and fauna to be found in this strange land. Despite professing some enlightened views about providing a civilising influence on the convicts, I noticed it was the Captain himself who was the first to shoot something. We then met Second Lieutenant Ralph Clark, a young officer missing his wife back home terribly and keen to find some way of earning his superior’s approval and preferment. One of the men suggested to him that he stage a play using the convicts as his cast, and he decided to act on this. 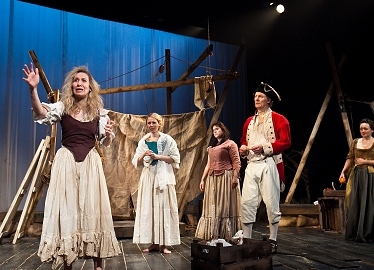 The rest of the play showed us the casting process, the convicts’ different attitudes and abilities, the response from the officers, especially those who objected to the play being put on, and the developing relationship between Ralph and Mary Brenham, his lead actress and one of the few convicts who could read. The final scene showed the start of their performance, with the stage audience on the other side of the curtains as we watched the back stage preparations. From the reactions we could hear, this was going to be a total success, and rightly so. There was so much meat to this performance that it’s hard to know where to begin. The story was told very clearly, and at times it was difficult to watch. The abuse of these people, treating them as sub-human when they were mostly ill-educated and poor, was beyond moving. These were harsh times, and people were being transported for stealing a loaf of bread. The number of lashes needed to be effective was being discussed by the officers at one point, and two hundred seemed to be a reasonable amount to them – it’s clear they never expected to be on the receiving end. I soon found myself longing, as the prisoners did, for the relief of a rehearsal scene; even so, the author cleverly increased the tension by having the most unpleasant officers invade the final rehearsal we see and, overriding Ralph’s protests, abuse the convict actors horribly. It only stops because one of them, the most enthusiastic actor of the troupe, starts performing and the others join in, a brave choice in the circumstances but the only possible one if the play was to go on. From time to time throughout the play, one of the natives came on stage and commented on what he saw. At first he thought these strange white people were part of a dream, but it didn’t take him long to realise they’re no dream; nightmare more like. Just before the final scene, as they were setting up the stage, the native appeared again but this time he was covered in sores from the diseases the white folk have brought with them. This oblique referencing of the natives’ experience was very powerful, as it emphasised both the impact which the new arrivals had and their disinterest in the native population – two hours of soapboxing wouldn’t have been so effective. I want to remember so much about this play that I know I won’t be able to get it all down in time. There were so many layers that I’m still discovering things as I write. The discussion among the officers showed us their brutality, and with the doubling, it emphasised for me that the officers and men were just as brutal and uncivilised as the prisoners, but with the power they had they could express it more easily. There were educated prisoners as well such as Mary and John Wisehammer, who was also interested in Mary but had to watch as she and Ralph gradually became an item. Harry Brewer represented the guilty conscience, as his obsession with the ghost of a man he’d hanged on ship eventually drove him to madness and death. His relationship with Duckling Smith, in which he wanted some kindness and she withheld it until it was too late, showed the difficulty for women in those conditions. They were expected to provide ‘comfort’ for the men, but how could they then have any affection or tenderness in a relationship? Ralph’s gradual change from dedicated husband to Mary’s lover was nicely done, and there were many lovely moments in the performance. I did find it hard to hear the lines occasionally – Liz Morden’s story was particularly quiet – but it didn’t stop me understanding what was going on. The music was good – we like traditional folk songs – and the cast did a fantastic job. It’s still early in the tour, so it may even improve, though we were very happy with our experience. It’s a dark piece covering a difficult subject, and it’s a shame there weren’t more people in the audience to appreciate this excellent production. I can understand the difficulty, but this is definitely a modern classic – should be done in schools if it isn’t already – and I wish them every success with the tour.